I wrote about Tencent Holdings Ltd. (TCEHY) way back in early December. At the time I stated, "TCEHY is correcting and the key question is how far down can this pullback/correction carry." After that article appeared on Real Money I got a less- than-nice email that my analysis was "seriously flawed." In full disclosure TCEHY did rally in January but none of the indicators confirmed those highs. 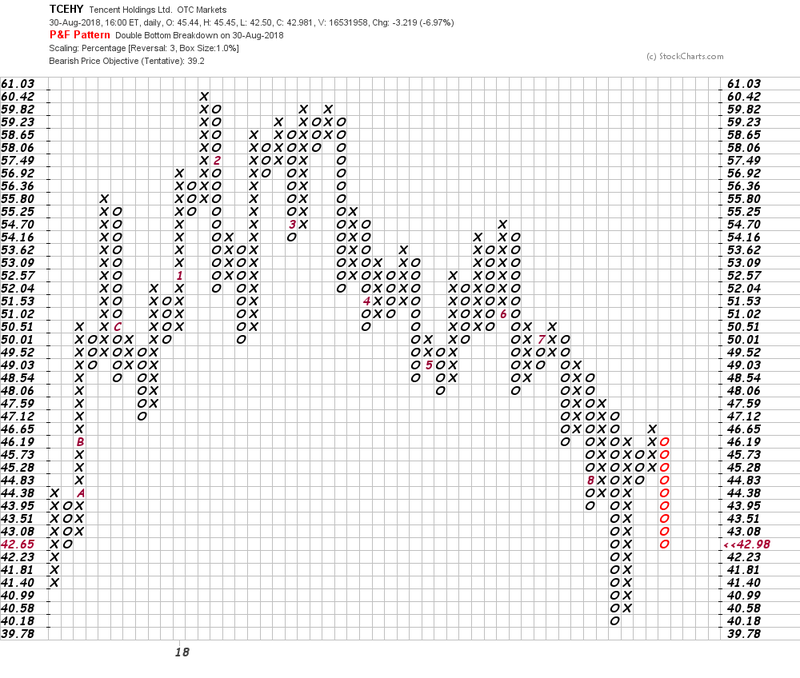 In that article was a Point and Figure chart with a downside price target of $41.73. With TCEHY touching $40 earlier this month a fresh look at the charts is needed. In this updated daily bar chart of TCEHY, below, we can see that prices have spent much of this new year below the declining 50-day moving average line. The slower-to-react 200-day moving average line has peaked and now has a slightly negative slope. The peak in the On-Balance-Volume (OBV) line was back in late November and the downward slope continues with a new low this month. A declining OBV line tells me that sellers of TCEHY have been more aggressive, with heavier volume transacted on days when prices have closed lower. The Moving Average Convergence Divergence (MACD) oscillator has been below the zero line for most of the time since late March. In this weekly bar chart of TCEHY, below, we have a bearish alignment of our favorite indicators. Prices are below the declining 40-week moving average line. There might be some chart support around $35, but the next potential support would be in the upper $20s. The weekly OBV line is in a tailspin and the MACD oscillator is in a bearish configuration below the zero line. In this updated Point and Figure chart of TCEHY, below, we can see a new downside price target of $39.20. If this target is reached it will be a new low for the move down. Bottom line strategy: TCEHY is in a downtrend with no bottoming action to speak of. We have a Point and Figure target near $39 and no major chart support until around $35. Avoid the long side.